Preheat the oven to 150C and grease and line an 8 inch cake tin. 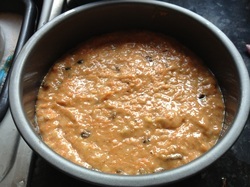 Beat the eggs in a large bowl and then add the grated carrot, chopped walnuts, sultanas, sugar and oil. Sift in the flour, spices, xanthan gum and bicarbonate of soda and mix until all the ingredients are combined. Pour mixture into prepared tin and cook in the oven for an hour and fifteen minutes . Check it is cooked by placing a skewer in the middle, it should come out clean. To make the icing, place all the ingredients in a bowl and mix well until smooth. Spread over the cake and decorate how ever you like! 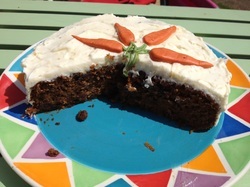 This recipe was the result of reading several normal carrot cake recipes. 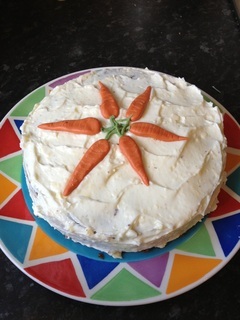 Special mention must go to Mary Berry and Rachel Allen for ideas and inspiration. 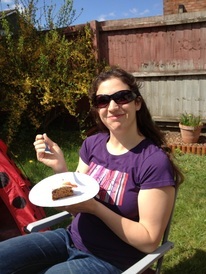 I altered the recipes to make a gluten-free cake, and it worked marvellously! It was amazingly moist and tasted very fruity and spicy. I may experiment with different fruits or nuts to see how they make a difference, but it went down very well with Amelia, and everyone else!